NORTHRIDGE – The CSUN women’s tennis team competed in their final tournament before the heart of dual season when they traveled to Long Beach for the LBSU Winter Invitational Jan 18-20. For the doubles section of the tournament, the team of Skyla Alcon and Ana Isabel Fraile Toboso picked up the slack after an opening day loss to LBSU, and a winless day one for the Matadors. 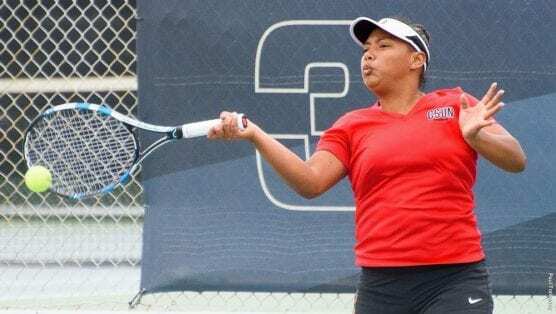 Alcon and Toboso notched two victories on Saturday and Sunday when they defeated Meszaros/Rees from Portland State (6-2), and Chow/Tyrina (6-3) from the University of San Diego. In the singles portion of the tournament, the Matadors were swept in both Friday and Saturday of the competition before Alcon, Coetzee, Demirbaga and Roenholt won their respective matches on Sunday. All singles wins came against Portland State. In all 10 matches against the Vikings (singles and doubles), the Matadors grabbed seven wins. CSUN (1-1) will continue the dual portion of its schedule when the Matadors take on the Westmont Warriors Saturday Jan. 26.